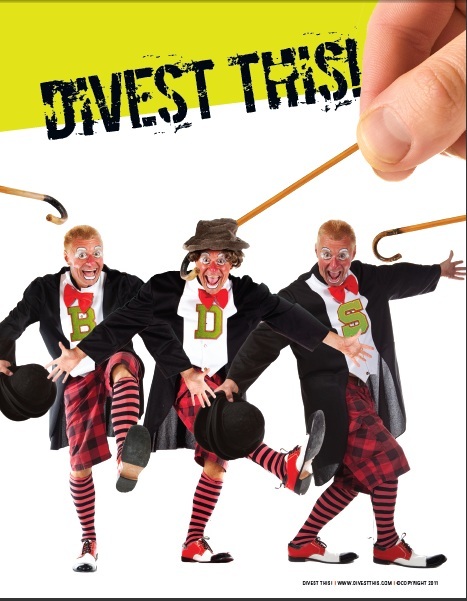 Team BDS has developed a bit of a track record with regard to discovering or anticipating economic trends, then claiming credit for business decisions that have absolutely nothing to do with their boycott and divestment efforts (or any other political issue, for that matter). Exhibit A: In 2009, Motorola’s decided to get out of a certain line of defense business, selling off a $20MM unit that had just one customer (the Israeli Defense Forces) to its Israeli partner. “Motorola Divests from Israel!” was the announcement that went out via the BDS megaphones, ignoring the fact that this divestment “victory” was nothing more than a business decision by a huge company to sell off a small subsidiary with no political implications whatsoever (unless you want to draw some from the fact that Motorola was more than happy to sell valuable defense technology to the dreaded Zionist entity). Exhibit B: Africa-Israel, an Israeli holding company which was highly leveraged and heavily invested in property, found it stock crashing to the ground when the real estate market went bust in 2008-2009.To no normal person’s surprise, this led to a selloff of Africa-Israel shares by institutional stockholders (with many of those decisions made by software programmed to automatically sell company shares that dropped a certain percentage). But as major investors like TIAA-CREF and Blackrock did what they do normally (dump shares of plummeting stock), the BDSers were right there announcing that each and every one of these decisions arose from their political pressure. Exhibit C: During a decade when the boycott and divestment brigade were working tirelessly to bring Israel’s economy to its knees, that economy instead doubled in size eventually leading to Israel’s acceptance into the Organization for Economic Cooperation and Development (OECD) – again over the boycotter’s objections – giving Israel membership into the club of first-world economies. The only thing was that shares of many Israeli companies were held by investment and retirement funds that were only chartered to buy and sell in companies in emerging markets. But once the Israel market was no longer emerging but emerged, these funds had no choice but to sell off those equities. “We win again!” Rang from the rooftops of BDS-land, this time claiming Harvard (a university that has vehemently rejected divestment entreaties for years) had followed their recommended path and divested from “Apartheid Israel”. Now in many of these cases, members of one or more sub-division of the “Israel is to Blame for Everything” cult did make calls for Motorola, TIAA-CREF, Blackrock, Harvard and other investors to divest from the Jewish state.And in most of those cases, these calls did precede the selling decisions noted above. But like the rooster taking credit for the sunrise, team BDS seems to have a penchant for the Post Hoc fallacy of claiming a win for everything that happens anytime after they open their mouths (even when the people allegedly doing all this divesting vehemently deny any political motives in their decision making). I bring this up because another target of anti-Israel protest, the European industrial giant Veolia, has decided to pull up stakes and get out of the Israeli transportation industry (a role that caused them some controversy earlier this year). What the BDSers might fail to mention however (presuming they decide to use this story to anchor another round of “We Win Again” press releases) is that Veolia is not just getting out of the Israeli transport industry, they are fleeing the transportation industry worldwide. Like other European countries bracing for an expected financial meltdown on the continent sometime in the next few months, Veolia is going through a major retrenchment, attempting to reduce it size by 20%, partly by getting out of fields not central to its core water and environmental business. Like Motorola, Veolia is more than happy to sell off its Israeli business to Israeli partners. And like all of the companies mentioned above, Veolia’s decisions vis-à-vis Israel have nothing to do with politics, BDS or otherwise. In fact, the company plans to remain in Israel, albeit just focusing on the aforementioned water and environmental business they have decided to stay in. Now I may simply be speculating that BDS printing presses are getting set to spin yet another purely financial decision in political terms. If this is unfair of me, then I apologize to any boycotters out there in advance. But given their track record, I suspect the only thing keeping the divestment cru from taking credit for this particular sunrise is knowledge that we’re onto their tactics and are looking forward to exposing the next BDS fraud the minute they try to perpetrate one. What's the better approach, I wonder — explain the facts to BDSers, or let them believe that they *did* cause the sun to rise? I can see how either approach could have benefits and drawbacks, unfortunately. Don't ignore . The only approach is to counter their every lie and pernicious piece of propaganda . Form action groups who are prepared not just to fight a war of words on blog sites , letter writing and an endless round of circulating links highlighting the work of these scum bags . It requires street activists who are prepared to counter their every demo , participation in uni debates and go to their meetings . Here in London and I'm sure elsewhere we do just that . We countered their Ahava protest for 18 months. We organised not only buy cotts but mobilized activists around their target supermarkets on their European day of action recently . Trawl their web sites and face book pages for info .